Eco-conscious people who care about Lithuanian nature and cultural heritage may contribute to preserving Neris regional park. 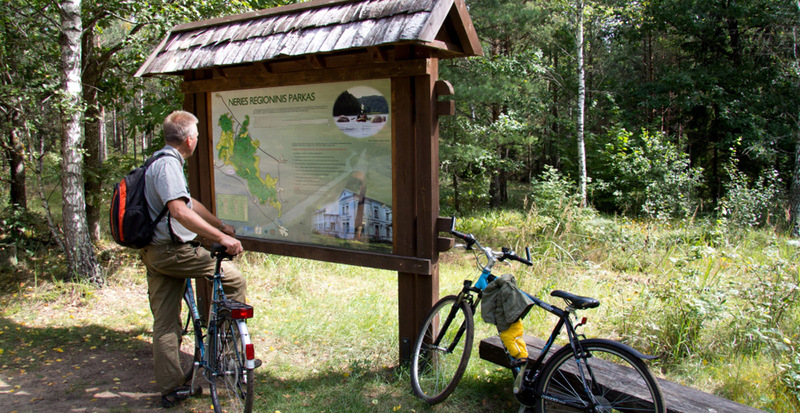 Since 15 May 2015, Visitor ticket was introduced in Lithuania’s national and regional parks. All of the funds received for the visitor’s ticket come back to the territory of the park! These funds are being used for the maintenance and management of natural sites and recreational areas, for renovation of our information stands, for waste collection and garbage removal, as well as for the educational purposes – publications of tourist brochures, nature lessons for kids, environmental events for families. Single visitor’s ticket (valid for 5 days) to the Neris regional park costs only 1 Euro. Monthly ticket to Neris regional park costs 5 Euros. Monthly ticket to all the state parks (4 national and 28 regional parks) costs 10 Euros. Annual ticket to all of the state parks costs 20 Euros. Annual family ticket to all of the state parks costs 25 Euros. SMS ticket – send an SMS “NRP” to 1860. You will receive a message with a single ticket that is valid for 5 days (ticket costs 1 € plus additional 0.35 Euro service fee). Become nature’s friend! Contribute to preservation of the Neris regional park!